On 28th November Berber Bevernage (Associate Professor of Philosophy and Historical Theory, University of Ghent and co-founder of the recently formed ‘International Network for Theory of History’, or the “INTH”) presented the penultimate paper of the current ‘Research Seminar in the Philosophy of History’ run by the University of London’s ‘Institute of Historical Research’. And, by way of a very brief sketch of his general position and concerns, I would highlight Berber’s particular focus on the relationships taken to obtain between historical (in)justice and the ethics of history on the one side, and concepts of historicity and historical time on the other. Such concerns being articulated, in part, against a backdrop of government-appointed historical commissions and truth commissions – investigating, for instance, state-sponsored violence or “vanished” persons – where historians are in demand as expert witnesses and thus where the ever problematic notions of historical meaning and historical explanation, summoned in the guise of authoritative informants or perhaps adjudicators, are put into practice. Turning now to the paper itself (titled ‘The Future of the Theory and Philosophy of History’) which, while embracing these and other such difficulties, was presented very much in the shape of an invitation to the floor to come up with ideas, comments or criticisms that might assist in the determination of how, following its successful launch and bearing in mind at least some of its assumed responsibilities as noted, the INTH should best proceed. And while it is undeniably the case that Berber’s overall position on the matters discussed in his paper is eminently supportable and indeed crucial, the after-paper debate nevertheless robustly voiced suggestions and certain pertinent concerns in the spirit of that earlier invitation – concerns which were equally robustly answered by Berber. To give examples of what I have called ‘pertinent concerns’, Berber (who is himself moving towards a broader and collective ‘Philosophy of Historicities’ which is to include, for instance, history, memory, historical time and transitional justice) was questioned on the desirability of bringing history into his moral/political arguments and positions. Or, to put it differently, can the purposeful employment of the discourse of “history” be adequate or even relevant to the demands of such work? After all, history is just a concept which is already ideologically positioned and which functions within boundaries, the operative effect of which would be to severely restrict the breadth of the subsequent discourse. Seen in this light the much broader discourse of the intellectual, who unlike the historian is beholden to no one, might be a more appropriate choice of companion while pushing the exploration of moral and political arguments ‘beyond the boundaries’, as it were. Furthermore, one might perhaps question the lumping together of, or the conflation of, the ontologically different categories of history, memory and justice, if that is what is suggested here. So, to sum up, I would say that all those present enjoyed and benefitted both from an engaging paper and also from the vibrant exchange of thoughts and ideas which immediately followed it. On 31st October Frank Ankersmit presented a paper at the Institute of Historical Research (IHR) which he titled ‘The Ankersmit/Roth Controversy’. A controversy which had some months earlier positively exploded into the otherwise benign ambiance of Auditorium B at the University of Ghent. This splendid clash of theories and temperaments was triggered by Paul Roth’s comparatively blunt delivery of his own hard-hitting paper, ‘Whistling History: Ankersmit’s Neo-Tractarian Theory of Historical Representation’, which sought to fatally undermine Ankersmit’s current and in some respects radically new position as laid out in his latest book, Meaning, Truth and Reference in Historical Representation. Now, all this over-excitement and academic angst was unfolding during the second morning of a four day inaugural conference organised by the ‘International Network for Theory of History’. And I think that one might take Ankersmit’s subsequent IHR paper (which is under discussion here) as something of an aftershock consequent to or a reverberation from that morning’s disruptive event. I should add that Roth’s paper and an earlier written response to it by Ankersmit, both of which were made available to those attending the IHR on 31st October, will be published in a forthcoming edition of the journal Rethinking History. So, to the IHR presentation itself. In my view Ankersmit’s “contra-Roth” arguments, delivered from his own exercise book jottings, were generally weak and they failed to properly address issues raised by Roth in his paper. Such shortcomings generated a lively after-paper debate during which Ankersmit, for me at least, failed to adequately tackle pertinent questions raised. For instance, when questioned on “frameworks” (a Quinean notion of frameworks championed by Roth in his paper which, arguably and not least, draws attention to a fatal flaw in Ankersmit’s “experiential” theories) he summarily rejected the notion regardless of its importance to various elements of his own overall theoretical position. And it’s interesting to note here that Ankersmit actually drew on Quinean logic in some of his earlier works. 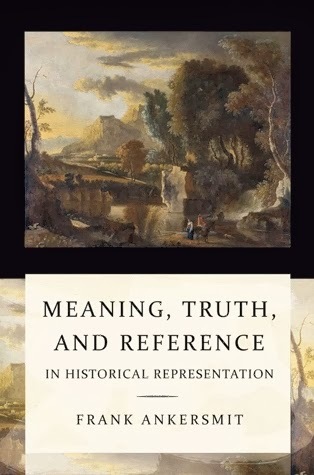 On the matter of ‘historical truth’ – surely an impoverished, redundant notion today – Ankersmit now claims, contrary to his former and for me much better position on the matter, that truth can be found at the aesthetic or figural level of the whole historical text. Accordingly, it would appear that he is now arguing for a historical-truth-at-the-end-of-inquiry style of philosophy, a sort of reification of the aesthetic/figural, which entirely and rather conspicuously contradicts his earlier works. This new Ankersmitean “revelation”, being unworkable, was robustly and I think effectively challenged from the floor, a challenge which was further compounded through a more general critique levelled at certain inconsistencies and incoherencies which, it was argued, both characterise and diminish Ankersmit’s own philosophical position. Anyway, by the end of the evening Ankersmit looked somewhat bruised and I think – this is just a hunch – that he might have regretted agreeing to come to the IHR in the first place. After all, he had travelled all the way from Groningen to air a grievance against Roth which, in all probability, only a small number of IHR attendees would have much known about or, indeed, much cared about. And it should also be noted that Paul Roth was not, so far as I know, invited to attend the IHR event himself and he was thus not in a position to defend himself against Ankersmit’s various charges as presented – an altogether lamentable state of affairs.